“It’s like those streams in the sky that airplanes leave when they fly,” I told him. I told him about a quiet summer day back when I was 17, lifeguarding at a mostly empty pool, deeming it safe enough to take a few moments to stare up at the sunny, blue sky instead of the one adult floating steadily on his back in a shallow pool. Growing up not too far from the Philadelphia International Airport, it was always easy to find a couple airplanes in the sky at any given moment. I counted all that I could see from my two little eyes- from the innermost tear duct, to the outermost corner of my eye just before sclera meets skin fold. There’s three; There’s four, I noted, continuing to count, only halfway through my inventory of the azure sky. But rather than counting, I found something else that caught my attention: the evaporation of those white, jagged, cloud-like lines that the planes leave behind. Turns out they’re called “contrails,” short for condensation trails. 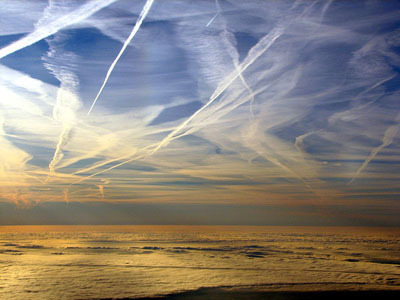 Contrails are formed when the water in jet exhaust meets the wet, cold air of the atmosphere at 30-some-thousand feet. Upon this collision of jet exhaust and moist air, the contrail condenses and freezes into ice crystals, making a thin cirrus cloud. How long these vapor trails remain in the sky depends on the temperature and humidity at the altitude of the contrail’s formation. * Regardless, whether seconds or minutes, slowly, the end tail will dissipate, showing no evidence that the plane was once hundreds of feet behind, in another position of the sky. Gone. Nothing you can do can bring those jet lines back. It’s a lot like life, I realized that summer day on the lifeguard stand. Now, I walk around each day with this strange, sickening sense that whatever I’m doing right now with my fingers, or whatever conversation I’m having with the person next to me, is just like those contrails, never able to be repeated in that specific place, time, and date. I go to bed each night, thinking about what happened since I left it this morning. I can’t remember half of it. What did I eat for breakfast, anyway? Did I tell my parents I loved them today? Yikes, did I really gripe in my head over who was the last one to discard the free newspaper full of ads that unwantedly finds itself on our sidewalk each week? I feel like I walk around, and each moment is slowly evaporating, never to be tasted, touched, patted, embraced, changed, re-shapened, molded, or experienced, ever again, at least not in real time. There’s nothing I can do to bring back what happened 15 seconds ago. Whatever you’re doing, and I’m doing, right now, will change, in just a few short inhales, exhales, and blinks, almost imperceptibly, perhaps. But change it will. This hour will not last. This day will not last. This year will not last. And you too, no matter your age, will become old one day, perhaps if we’re lucky enough to see the rising sun on our one hundredth birthday. We look back on old pictures. That is, until Aunt Lou, or your college roommate, or your dear parents remind you of something. The still frame that they remember in their head. Some funny thing you said. Some detail you couldn’t recall. Some bit of the scene that you didn’t quite remember, but now, upon provocation, comes forth, memory jogged by this person’s memories. This causes your heart to quicken and a smile to slide up your face, as though you were wearing lose suspenders, and now tightened them for a satisfying fit. You then chime in your memories of the new scene you now remember, your contribution to this mutual, shared memory. But that’s it; that’s all they are now. These still photos. We look at the past, and no matter what shade of awful we went through, we can now talk about the hard practice we survived as a high school varsity football player, singing about our glory days. Or that immensely intense triathlon race, that in the present moment, leaves you half miserable, in fervent longing for it all to be over, and yet, you keep running, half flooded with a bizarre energy that sustains your movement until a finish line tells you to stop, tells your endorphins to surge, and your heart rate to decelerate. Now that it’s over, and you’re re-visiting the experience as a memory, we’re glad these kinds of experiences were so hard. It makes us look like champions, looking at these still photos of our hard work in the comfort of our own home, heart rate relaxed. We smile at the graduation pictures. Smile at the pictures of our parents, before they were our parents. We laugh at how silly we looked in our teddy bear vest on 5th grade picture day. All of this leads me to wonder, awe, and melancholy over the mystery that is the passage of time. For all intents and purposes, that time is gone. How is it that our minutes evaporate? How is it that we can’t go back? It’s like a locked door, with no key to open it. We scratch our head, looking up for answers. Did it even happen? Did all of this even happen? I yearn for yesterday’s moments all over again, from my morning bike ride commute, to the belly laugh that my roommate and I shared, as if to have one extra day of life. I want to re-experience the morning of April 4th, as I was about to embark on my flight to Portland for four days, a sojourner excited to interact with west coast folk. I want today, and I want the future, to enter in and out of each of these scenes with ease and possibility. No locked doors, just tall, open bay view windows, and a warm breeze to lull you in and out of the past and present, forward and back, back and forward. Any direction you chose, any moment you wish to re-experience again. This lament over the passage of time is the same reason why I both weep a little each New Year’s Eve, recounting all of the events, new people and travel that took place over the course of these past 365 days; and in the same breath, the very same reason why just moments later, I beam my face into the moonlight of the dark January 1st sky at 12 AM, bright, optimistic, satisfied, hopeful. The people of the 1800s are dead now. They don’t get to have this moment, not here on Earth at least. The people who will one day be born in 2100 are just future zygotes, not here on Earth right now either. But you and me, we’re here right now. On the verge of something great, unprecedented and un-experienced. I stand hilltop, watching New Year’s early morning fireworks, just for one moment, wanting to cup the year securely and lovingly in my two hands, gently whispering to it: “It’s ok. Let go. You’re in a new year. You take with you all you learned last year, and years’ past. You’re lucky enough to see the aurora of a new year, a fresh calendar. It’s all there, right in front of you, untouched, like early dawn snow free of any human footprints. Yes, something wonderful is going to happen this year. Something hard will happen. Something unexpected will happen. But, perhaps, if you’re lucky enough, you’ll be here again in 365 days wondering where all this time has gone, each turning of the monthly calendar a mere contrail into the vast, bottomless vat known as the passage of time. So enjoy this moment of newness.” I un-cup my hands and spread them high over my head, a “namaste” to the night sky on the first of the year. Free, outstretched, fingers loose, winter air flowing in between each finger, I clamor for the power to hold onto every ephemeral moment. It reminds me of family vacations at Rehoboth Beach as a kid. When I needed some solitude, perhaps after too much teasing from my older brother, or after I had enough of my sister’s wails as seagull after seagull snatched her Cheetos from her beach towel, I would plop myself on the shoreline, digging my feet into the cool, mushy sand. As waves pushed and pulled around me, my feet sunk deeper into the wet sand. Eventually, once satisfied with the proper dosage of introverted loneness, I’d step out of my footprint and watch the next wave take away a bit of it, footprint still mostly visible. And then another wave would come forth and retreat, taking away a pinky toe imprint along with it. And another wave followed, erasing another toe, and another, and so on, until that footprint was no more, washed away. Dissolved. Recycled by the ever constant flow of ocean wave. I’d then walk back to my sister’s towel, seagulls having moved on to some other child’s unattended snack, my brother now gone, having left the ocean for the pool, sick of the sand. Most of this afternoon was now gone. Soon, we’d seeing the last hours of our vacation, and head northbound up 95 back to PA, codifying each day’s activities, the highs and lows, so that one day we can look back on Family Vacation 1995 and actually have something to say. And so the continuum of time proceeds, right off the reel. Back to remembering and forgetting, lamenting, and praising our time on this planet. I guess the good thing about getting older is you get to keep experiencing time, making new memories, printing out more pictures for your frames and refrigerator magnets. And maybe, just maybe, if all I’ve been taught about what happens when you die is true, I’ll realize that we never even had the proverbial hourglass of time. Or perhaps we did, but once all the grains reached the bottom, the hourglass automatically flipped itself to begin the release of sand grains all over again. It will keep on going infinitely, whether stored in my cognition, or flat out in front of me like a red carpet. Time’s gone by. 26.5 years for me, in fact. The passage of time will never stop. But like contrails in the sky, I’ll keep on flying this girl high on an airplane into the unknown freedom of a blue sky, gripping every minute in gratitude, lament, joy, life transcendent, documenting my flight, and yours too, for some other kid to look up into the sky and trace the contrails with her or his fingers. Together, we’ll dizzy up the sky with our vapor trails until we’ve lost track of time. Until we learned to live outside of it, freed of the obsession of time. Out of time, in one sense, and in another, having all the time we’ll ever need. The saddest thing about life is you don’t remember half of it. You don’t even remember half of half of it. it’s as though you hadn’t lived the parts you don’t remember.